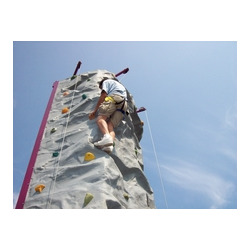 The Rock Climbing Wall is as fun as it is challenging. There are 3 levels of difficulty to meet everyone's adventurous spirit. Our Rock Wall is auto belay, so we can concentrate on helping and encouraging the climbers all the way up. Our event staff is trained to coach the climbers and encourage them as they strive for the top of the Rock Wall. We really enjoy seeing the joy and satisfaction that every party attendee walks away with after climbing our 24ft tall Rock Climbing Wall.